Chemical Process Flow Diagram illustrates the relationship between the basic equipment as well as the overall structure of pipelines and other supporting equipment. The purpose of the Process Flow Diagram (PFD) is to build the image of the basic idea of the chemical process. ConceptDraw DIAGRAM together with its Chemical and Process Engineering solution delivers the possibility to design Chemical Process Flow diagrams using process flow diagram symbols. It is designed for chemical industry engineers and designers. Making a process flow diagram involves many different elements that can be managed using ConceptDraw DIAGRAM. 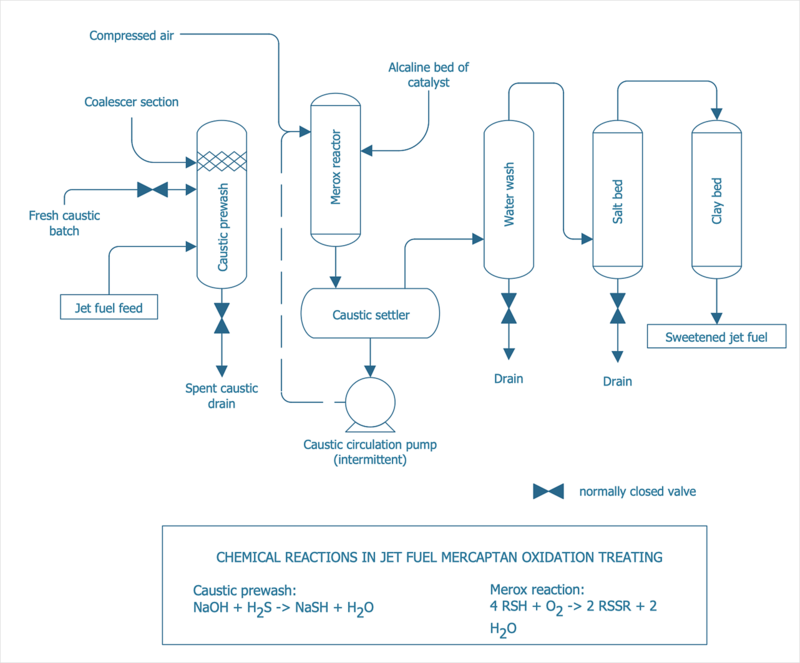 The ability to draw Chemical Process Flow diagrams is delivered by the Chemical and Process Engineering solution. This solution supplied with 8 libraries that contain process diagram templates and more than 400 vector stencils of Chemical and Process Engineering elements. Run ConceptDraw DIAGRAM new document. Select libraries from the Chemical Process Engineering libraries on the Solutions panel. Add objects to the drawing by dragging them from the libraries panel to the document page. Use a diverse set of connectors to connect the diagram elements. Select a proper connector from the diverse set of connectors on the drawing tools panel. To connect elements using this tool, drag the connector from one connect dot to another. Use Clone tool to quickly add copies of the selected object. Don't forget to supply your diagram with text description. Use the text tools to do this. Result: With the help of a Chemical Process Flow diagram you can visually describe the workflow at each stage of chemical process. Quickly create engineering drawings, mechanical schemes, process flow diagrams.